As the holiday season approaches, I reflect on how quickly our farm has grown & all that we have been able to accomplish thanks to the encouragement of dedicated folks like yourselves! From the summer CSA members to introductions by friends to local chefs (thanks Joe & Dee Marley!) to those who came to our Lenny Boy markets, all we do would not be possible without your support. 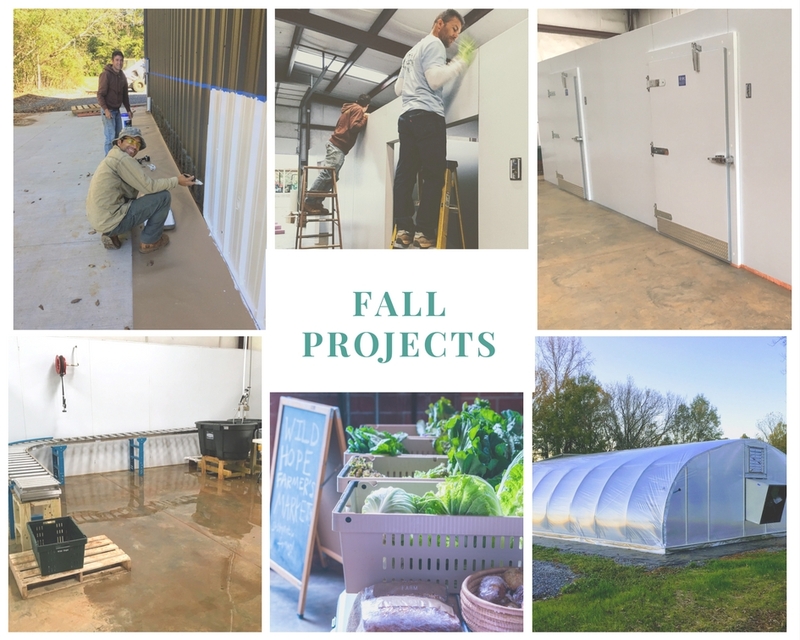 This fall has been a lesson of patience and persistence as we make slow & steady progress on a number of diverse projects - building a bin & produce washing station, hosting pop-up markets, establishing relationships with chefs, assembling a beautiful walk-in cooler, completing the greenhouse, outfitting our refrigerated cooler, building a well house, etc. See the photo below for a preview of what we've been up to! But all the hard work is well worth it when you receive an email from chef Jon at Customshop asking for that "good good green stuff" or you run into Pat Sheehan who claims our broccoli is the best he's ever tasted. The Wild Hope Farm community is slowly growing!